One of the most frustrating things a film can do is have a third act so good that it feels as if the first two acts don't deserve it. It means that when you leave the cinema you're overflowing with joy or emotion or tension or whatever the film excelled in during its final stretch. However, it also means that about two or three hours later, when the emotion you were feeling has calmed down and you can look at the film properly and without clouded judgement, you start seeing the film for what it really was: eighty minutes of decent, and forty minutes of great. J.A. Bayona's A Monster Calls fits this category to a T. So it's not that the first two thirds of the film are bad, it's just that they're uneven, and then it somehow builds to a finale that packs more emotion and more power than anything the film has even hinted at. It comes as a shock, and a pretty pleasant one at that, but it also makes A Monster Calls feel even more frustrating as a film experience than it would have if the last act were the same quality as the first two. It wouldn't make for a better film, but at least it would keep things in balance. The film ticks essentially every box on the coming of age checklist. Well, until it adds a new one. Conor O'Malley (Lewis MacDougall) doesn't have it very easy. His mother (Felicity Jones) is suffering from a terminal illness, his Dad (Toby Kebbell) has fled to America with a new life, his Grandmother (Sigourney Weaver) is strict and stern and mean, and he is bullied at school. Using his artistic abilities as escapism, he spends his nights drawing - just like his mother used to when she was young. One night, a giant tree near Conor's house appears to wake up and approaches him, telling him that he will soon tell him three stories that will help him get through this turbulent part of his life. So to return to that checklist, terminally ill family member? Check. Tough time at school? Check. Mean older relative? Check. And, erm, giant tree monster voiced by Liam Neeson? Check. A Monster Calls is a bizarre clash of genres right from the offset; there's coming of age in there, there's the fairy tale element of the monster, the fantasy style stories he tells (which are depicted in beautiful animated sequences), and it can also fall pretty heavily into standard weepy drama territory as well. In short, there's a lot going on. For the first two acts, A Monster Calls struggles to bring everything to the table evenly. Conor's dad is given a bunch of ropy lines about failed dreams and mismatched love, and none of it really sticks. Weaver also initially struggles to settle into her role given how flatly she's written, although it's worth noting that the film resolves her character's issues later on in a surprisingly delicate way. The tonal leaps and bounds the film often makes in its opening act also begin to grate. After all, one moment we're seeing a young boy and his dying mother curled up on the sofa watching movies, and the next there's a giant tree crashing through walls and sitting on house extensions. It frequently crumbles under the multitude of genres and tones it's selling, but only momentarily. It's only the transitions that feel off, no complete scene in the film feels misjudged. Well, aside from the bullying scenes, which never really have the impact they should do. When this climaxes with Conor summoning the Monster inside his school cafeteria, it goes a bit far and seemingly doesn't realise that the whole thing was just a little bit too silly. 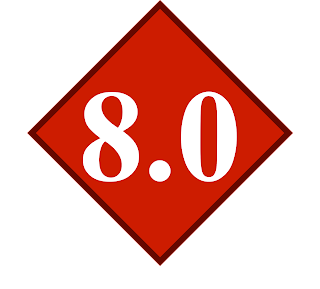 What keeps you interested throughout the uneven first half, though, is the performances. Jones is reliably terrific as Conor's mother, she never overplays any given moment or misses an emotional beat. Her small glances to Conor say more than any scripted words ever could. Speaking of Conor, well, MacDougall is terrific. He struggles in the opening scenes but once the story begins to pick up the pace, he sells it. The emotion he brings to the film's final act is extraordinary, and him and Jones together form a powerful bond that achieves the tough task of making you feel the pain of losing a mother to a terminal illness, as well as understanding the agony of the same situation from the mother's perspective. 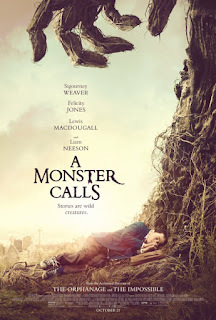 It's this final act where A Monster Calls finally realises what it should be, and abandons its bizarre tonal shifts in favour of one strong atmosphere, and rides it through to the finish line. The journey to get there isn't perfect, but the destination will break your heart in more ways than one. It might not be subtle about doing so, but it wants your tears by the bucket load, and it isn't afraid to go out there and get them. The CGI for the monster is pretty great too. He's generally rendered really nicely, and the film incorporates the CGI into the world without it overstaying its welcome, which is a rarity in present day cinema. While, much like everything else, the film's cinematography is scarcely more than decent in its first half, Bayona eventually finds some spectacular stuff near his film's end. He starts dividing the frame down the middle repeatedly - most noticeably in a breathtaking shot that comes after Conor is forced by the Monster to endure his worst nightmare, as well as a moving scene in the hospital that places Conor and his mother in close up on the left of the frame and allows the Monster to fill the right - and it opens the film up to a lot more reading. Is Bayona finding a visual way to reflect the film's reality/fantasy divide? Could this be more symbolic of Conor leaving the childlike aspects of his life behind and moving on to something more mature? It's nice that the film, after such an uneven opening, eventually settles on something deep and thoughtful and unified. A Monster Calls has the potential to bring on tears by its end, and the very final sequence is moving in so many ways, you'll only wish it took a bit more care in putting all the pieces in place. To Summarise: While the journey there occasionally stumbles, A Monster Calls reaches a dramatic and emotional conclusion that makes the most out of its first-rate CGI and excellent performances from Felicity Jones and newcomer Lewis MacDougall.